Love to treat myself with these chips when they are on special . Very tasty crispy chips that are not heavy on the mouth or stomache . The problem is you can’t stop at one . 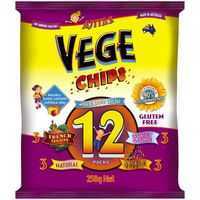 How would you rate Vege Chips Multi 12 Pack?